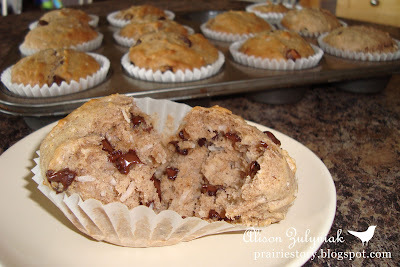 Thank you Tasty Kitchen for featuring my Chunky Monkey Banana Muffins as one of your Popular Recipes! My family loved these! I didn’t have coconut, but I took another reviewer’s suggestion and used peanut butter chips (1 3/4 cups) and a handful of semi-sweet and they were so delicious! I also only had 3 bananas, so I added about 1/2 cup unsweetened applesauce and they came out so moist and delicious. This may turn in to my go-to banana muffin recipe. I even had enough left over to bake a mini loaf. I made these tonight and they are FABULOUS!!! My kids loved them, my husband loved them and so did I. I made them in a big ol rush so was worried but they are PERFECT. I didn’t have buttermilk and since I am not a natural in the kitchen I hate not following recipes exactly, but thankfully you noted I could use milk. I will definitely use buttermilk next time though. Could they possibly get better?? This is going to become a regular around my house! These are pretty freaking tasty. Made em. Froze some. Ate the rest. Prompty. Haha. Thanks for sharing. These are so delicious. Very moist and the flavors of banana, cinnamon, and chocolate is perfect. I made two changes. I left out the coconut and used a 10 oz. bag of mixed chocolate chips and peanut butter chips. And I only use butter. The next day I heated one up for about 10 seconds and it was to die for. Thanks so much. I followed the recipe with the exception of adding 6 bananas rather than four, and my family loves them! These would still be delicious if you chose to omit the chocolate chips and coconut and replace it with some chopped pecans or walnuts (or none at all). I may try that next time and probably stick with the extra bananas, since I think this is going to be my new banana muffin recipe! Thank you for sharking! I was a little concerned with using 2 tbsp of cinnamon but the aroma coming from the oven convinced me that I was onto something good by trying this recipe! These muffins are delicious and I wouldn’t change a thing. I might add some stuff just to play around with them but this is a tried and true recipe box recipe! Thanks for sharing! Delicious! Very moist and packed full of flavor. Next time I think I will add some toasted pecans. Wonderful recipe! I used 1/2 cup of whole wheat flour and 2 1/2 cups of white flour, omitted the chocolate chips and they were still YUMMY!! Thanks! These will be my go-to muffin recipe when I’m left with a lot of ripened bananas. These are so good! I halved the recipe and omitted the coconut. It still made 12 big muffins with a little batter left over. My husband isn’t a muffin fan, and he gobbled up two before I could blink.